Sustainability made simple and relevant! This video shared by Treehugger’s own Margaret Badore is a simple and excellent look at the changing landscape of recycling over the years. This 3-minute video discusses the switch from refillable to plastic bottles, and the actual source of the American anti-littering campaign. Towards the end of the video, she brings up the idea of “Product Stewardship,” which is a topic that has been generating interest lately. One of the more notable takes on the idea is within the book, Cradle to Cradle: Remaking the Way We Make Things. Written by Micheal Braungart, a renowned German chemist, and William McDonough, a famous American designer, the book explores the system of waste and product generation in the world today, as well as possible solutions to each of the issues presented. Personally, I highly recommend the book. It was one of the first I picked up in my search for continuing environmental education, and it was an awesome introduction into the world of greater thoughts on sustainability. Do you have any picks for some green reading? Let me know! Game day is here once again, Gator fans, so rise and shine to watch the boys of old florida do WORK in the Swamp. But while you’re enjoying the day’s festivities, why not take a hint from Albert and be a little greener? Whether you’re grilling and chilling in the comfort of your house or on campus, here are a few tips to ensure your game day is a little more eco-conscious. First of all, the simplest way to make a difference is to bring the same Earth friendly habits you have at home to your tailgate. The number one way to do this is to reduce the amount of waste you create. Use reusable dishes, cups and silverware instead of paper or plastic. They can be purchased cheaply at thrift stores, or you can pool your resources with your friends and use what you have. But if you must go disposable instead of reusable, recycle or compost everything you can. An easy way to encourage your guests to do the same is to have a clearly marked spot for recyclables and compostables. Do you want to do more? Consider volunteering for the Tailgator Recycling Team and helping to keep the Swamp clean and green. Time to fire up your grill. What to use, propane or charcoal? Propane may be a fossil fuel, but it burns cleaner, which means it releases less airborne pollutants into the atmosphere. Charcoal is much dirtier, not to mention more cumbersome and unwieldy. However, you can choose a better charcoal, one made of renewable, plant-based waste products like these coconut shell charcoal briquettes. Skipping the chemical-laden lighter fluid and using a charcoal chimney made of newspaper gets you even more bonus points. This handy tutorial explains the technique quite nicely. Now comes the fun part – food! Switching out your hot dogs and burgers for veggies is the easiest way to make your tailgate green. Vegetables taste awesome grilled, so even if you aren’t serving them as the main course, it doesn’t mean your tailgate has to be strictly carnivorous. Sourcing your munchies as locally as possible is another simple way to reduce your impact. Beverage wise, Gainesville has plenty of awesome local or organic brews just waiting to fill your coolers. As for the entertainment, remember to not leave your car running if you’re using the radio. Or, you can skip the fossil fuels all together and try something cooler, like this solar-powered wireless speaker system. Next is a tip that seasoned greenies are used to hearing, carpool! Walk, bike, bus or dance to the stadium, whatever works for you. Reduce your fossil fuel use and spend a little more time in nature in the process. And if you must bust out your hot rod, try not to ride solo. Plus, parking on game day is miserable anyway. Once you get to the stadium, remember that they recently added compost bins in addition to the recycling bins. You can now toss your empty popcorn box, hot dog wrapper and straws in the compost bins. Check the complete list of acceptable compost items out here. In the recycle bins, toss your plastic bottles, cups and spoons. You made it! 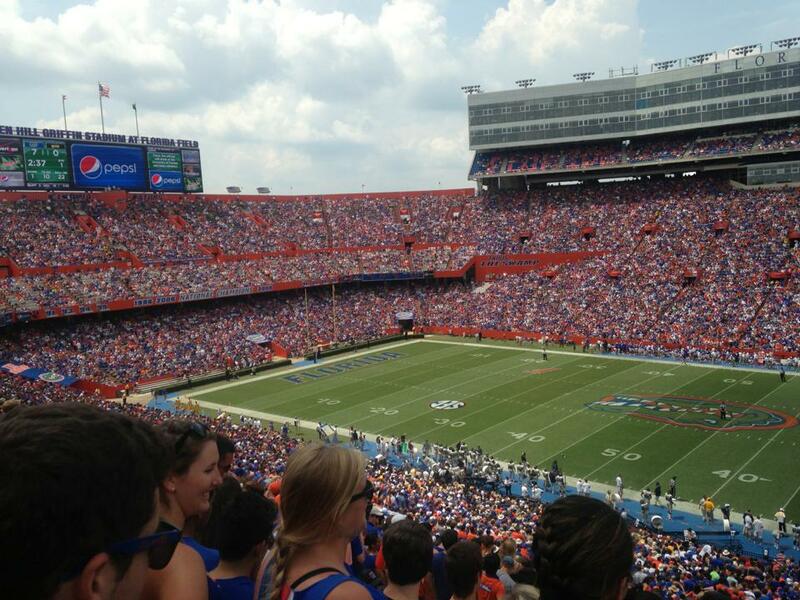 Now sit back, enjoy the game and go (green) Gators! Alachua County is great at recycling, but what about you? The numbers are in! Alachua County has had the highest recycling rates in the state of Florida two years running. That’s a whopping 50% of all solid waste recycled. Even the next runners up, Lee, Brevard and Marion counties, are a whole five percentage points behind. That effectively makes Gainesville one of the most sustainable counties in Florida. Pretty cool, right? What’s even cooler is knowing that the state of Florida has even bigger dreams. Florida has a goal to recycle 75% of all waste in every county by 2020. Impossible? Maybe. On the right track? Absolutely! Lofty goals like these push everyone involved to act aggressively to meet them, and that’s exactly what’s going to help our county, our state and our world become more sustainable. But why is recycling important? For one thing, by reusing materials, we cut down on how many new materials we need to harvest, including trees, water and oil. By recycling, we lessen groundwater leaching from landfills and air pollution from incineration. Recycling literally makes the planet a cleaner place to be. You can help Florida reach this goal by recycling as much as possible at home, at school and work. Recycling just one ton of paper saves 17 trees, 6953 gallons of water, 463 gallons of oil, 3.06 cubic yards of landfill space and 4077 kilowatt hours of energy. UF recycles over 2,000 tons of paper annually from campus. So next time you go to toss an old exam, aim for a recycling bin and let that scantron live on to terrorize someone else. But what about the caps? In order to get your recyclables in perfect condition for the bin, remove all caps from plastics. Plastic bags, trays and styrofoam are not accepted in the bins, so try and use less of them in general. Jars, bottles and aluminum cans should be rinsed and have the lids removed. Put the aluminum can lids inside the can for safety. Place the blue bin on top of the orange bin to protect your paper from the wind and rain. Remember not to include any plastic bags or foil wrappers. Please put shredded paper in a bag so it doesn’t fly away. However, pizza boxes are a special case. College students go through a fair lot of them, but most people have no idea that they are not recyclable if there’s any food contamination on them. So if your pizza box is a bit too greasy for the streets, why not try something more fun? Wait, You Can Recycle That? Wait! You Can’t Recycle That!